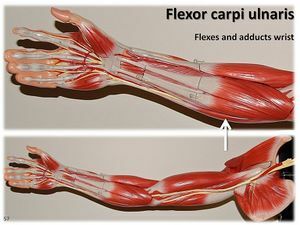 Flexor carpi ulnaris muscle (FCU) is the most medial flexor muscles in the superficial compartment of the forearm. It can adduct and flex the wrist at the same time; acts in tandem with FCR to flex the wrist and with the extensor carpi ulnaris to adduct the wrist. This muscle is the only muscle in the anterior compartment that is fully innervated by the ulnar nerve. A humeral head origin from the medial epicondyle of the humerus. It inserts at the base of Pisiform bone, hook of hamate and base of 5th metacarpal. FCU blood supply is via ulnar collateral arteries, and also anterior and posterior ulnar recurrent arteries. The ulnar nerve enters the forearm by passing between the humeral and the ulnar heads of its origin.Compression and entrapment of the ulnar nerve can occur between the two heads of the Flexor carpi ulnaris aponeurosis at the cubital tunnel; which a cap between the 2 heads of the Flexor carpi ulnaris.